I keep thinking of these words that I recently read somewhere: so much rage like a burning hula hoop. 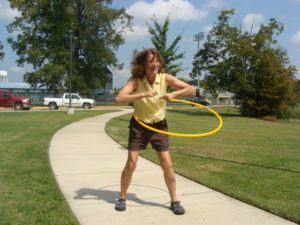 As a child, I couldn’t stop hula-hooping. Hour after hour, I’d shake my hips imagining I was an exotic hula dancer in Hawaii. I upped the hooping and had my sister pull me around the block while I stood on a lawn chair that was on top of the wagon, me on the chair hula-hooping through the hood. I thought someone would see this and I’d be on the “Ed Sullivan Show.” When I was alone in the yard, standing near the dogs stuck in the pen, sometimes telling them stories, sometimes just hula hooping in a rather zen-like trance, temporarily freeing the dogs and myself from where we really were, but never feeling rage like a burning hula-hoop, which makes me remember when a friend once said: You need to learn to get angry.